Welcome to "The Best Baby In The World Book" Giveaway! Sing your love! The loving lyrics and adorable illustrations make this book an instant classic that you'll want to share with baby over and over again. The sheet music is included at the end of the book. and sure to delight your little one! Check out the review HERE! 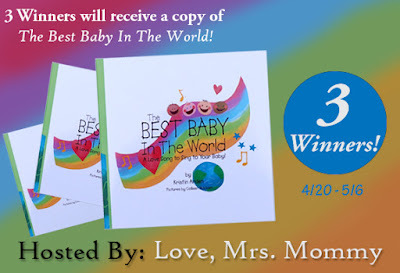 THREE (3) lucky winners will receive a copy of "The Best Baby in the World" (RV $30)! Contest is open to US residents only, 18+ (ends May 6th, 2016 at 11:59pm EST). All entries unless otherwise noted are optional. Please enter the giveaway form below. Please only claim an entry if you complete it. Winner will have 48 hours to respond or a new winner will be chosen. GOOD LUCK!